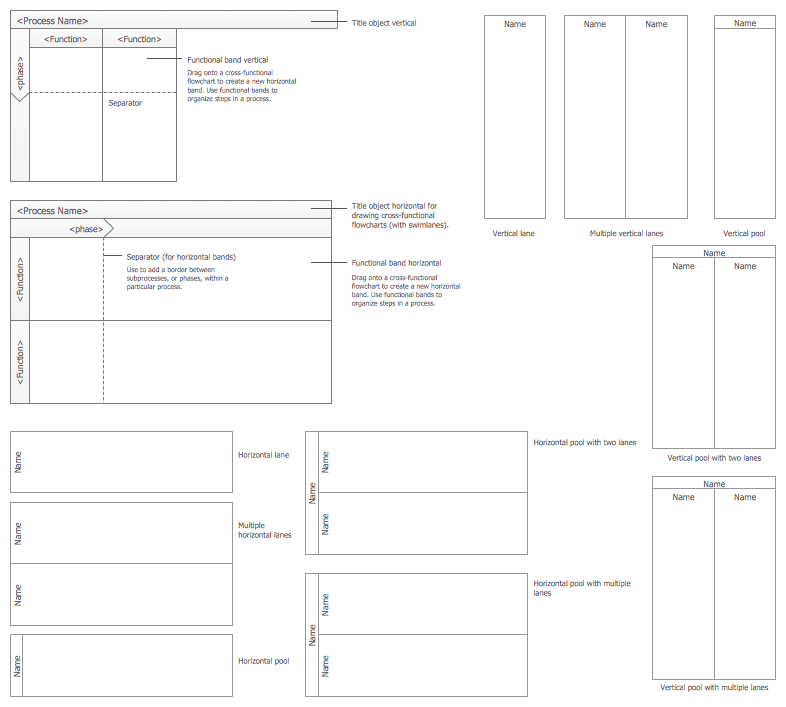 ConceptDraw DIAGRAM software extended with Flowcharts Solution from the "Diagrams" Area is a powerful software that will help you design the flowcharts for any business and technical processes, and software algorithms thanks to the predesigned flow chart symbols. 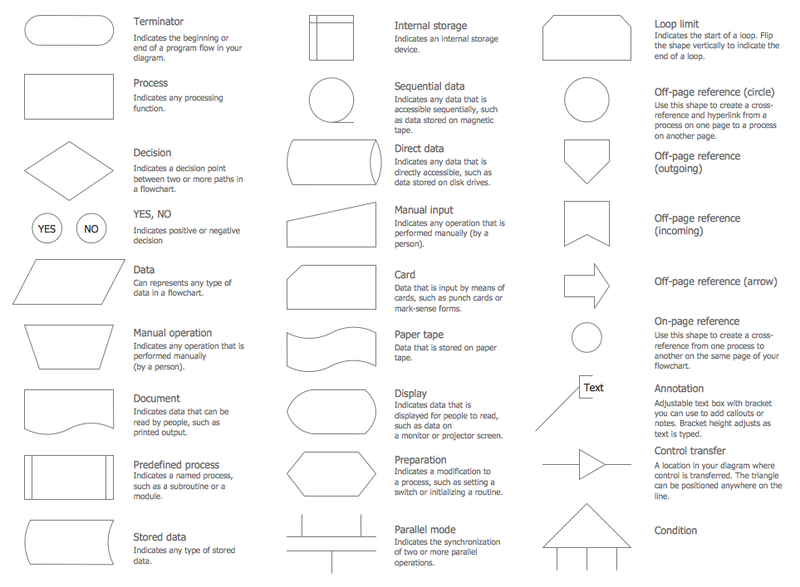 Set of flowchart symbols such as: terminator, process, decision, delay, data, document, multiple documents, subroutine, preparation, display,manual input, manual loop, loop limit, stored data,connectors and suming junctions, sort and merge operations, symbols of database and internal storage. that you can use to create your flowcharts quick and easy. Simply drag the predesigned flow chart symbols from the libraries to your document, arrange them, highlight with color the elements or background, type the text and flowchart title to get the excellent result – your own flowchart in minutes. Use of predesigned symbols from the Flowcharts Solution is very fast and easy way of flowchart drawing, and the most important – you don’t need to be the painter for this. This sample was created in ConceptDraw DIAGRAM using the flow chart symbols from the Flowcharts solution libraries. 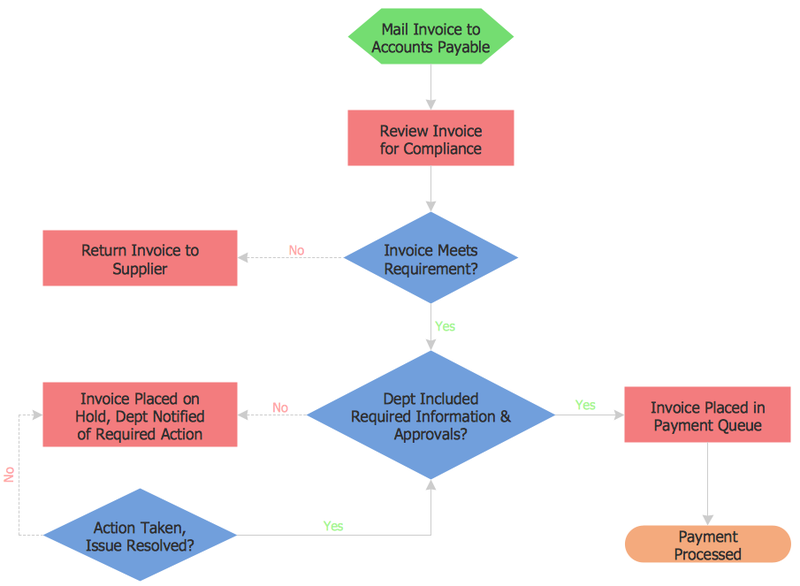 It shows the flowchart which visualizes the invoice payment process. An experienced user spent 10 minutes creating this sample. Use the flow chart symbols from the libraries of Flowcharts Solution for ConceptDraw DIAGRAM software to create your own professional looking flowcharts of any complexity quick, easy and effective, and then successfully use them. Stakeholder analysis in conflict resolution, project management, and business administration, is the process of identifying the individuals or groups that are likely to affect or be affected by a proposed action, and sorting them according to their impact on the action and the impact the action will have on them. Use the ConceptDraw DIAGRAM v12 diagramming and vector drawing software enhanced with powerful tools of Stakeholder Onion Diagrams Solution from the Management Area of ConceptDraw Solution Park to easy and effectively visualize stakeholder analysis.